Official figures show that the increase in total unemployment is slowing down, but long-term unemployment is rising sharply. 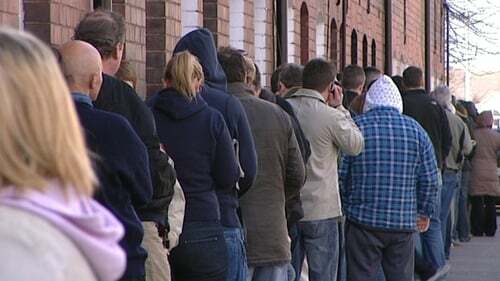 The Central Statistics Office said the long-term unemployment rate rose to 6.5% in the third quarter of 2010 from 3.2% at the same time last year. The CSO's quarterly national household survey says the number of long-term unemployed people rose by 69,000 to a total of 140,400 in the third quarter of this year. It added that long-term unemployment accounted for almost 47% of total unemployment, compared with 25% a year earlier. The total number of people unemployed in the third quarter was 299,000, up 19,200 or almost 7% from a year earlier. The CSO said this was the lowest annual rise since the first quarter of 2008. But the unemployment rate rose from 13.2% in the second quarter to 13.6%. Today's figures also show that the number of people in employment in the third quarter of this year fell by 70,900 (3.7%) to 1,851,500. This compares with an annual decrease of 8.8% the same time last year and was the smallest annual drop for two years. Compared with the same period last year, employment numbers fell in 11 of the CSO's 14 categories, with the biggest fall of 36,800 or 24.3% in construction. Construction employment has now fallen by almost 60% since the second quarter of 2007. There was also a big fall of 9.4% in the financial, insurance and property category. The CSO survey also shows that the number of non-Irish workers in the labour force fell by almost 13% over the year to 276,600. Just over 50,000 of these were unemployed.